While the news media provide day-to-day coverage of Arizona Rep. Gabrielle Giffords’ recovery from a bullet wound, similar dramas play out every day for American troops who return home with head injuries from combat. When a bullet struck Army Capt. Patrick Horan in the left side of his head, it was the start of a nearly four-year struggle to reach something resembling a normal life. Though no two gunshot wounds are the same, Horan and his wife, Patty, know very well what Giffords may face in her effort to return to her life as it was. Patrick was 35 when he was accidentally shot by an Iraqi soldier in July 2007. Like Giffords, 40, who on Wednesday was moved to a rehabilitation facility in Houston, the bullet damaged the left side of the brain, which typically governs speech and movement. Like her, he was unable to talk at first. The Horans say they have learned two hard lessons in the years since the shooting. One is that the brain has an amazing capacity to compensate for severe damage, slowly rewiring itself so healthy areas can take over tasks such as speech. Patrick chatters endlessly now with people, inquisitive and engaging, even if he frequently struggles for the right words. But the couple, who live in Maryland, also learned that the dream of a full recovery remains just that — something out of reach. Giffords, an Arizona Democrat, was shot Jan. 8 along with 18 others outside a Tucson supermarket. Jared Loughner, 22, is accused of killing six people in the attack, including a federal judge. Doctors at the Memorial Hermann Texas Medical Center Hospital, where Giffords was treated before she moved to rehab, said they implanted a tube in her head to drain excess cerebrospinal fluid. An accumulation of the fluid can create pressure and swelling in the brain. Patrick has gone through years of rehabilitation, and he and his wife say progress was always marked by ups and downs. The bullet hit Patrick behind his left temple and disintegrated inside his brain. Doctors at Bethesda Naval Medical Center had to remove a large section of his skull to give his brain room to swell, and had to fight off infection and pneumonia. Giffords was hit in the face; the bullet passed through her skull and out the back of her head. Therapists and doctors at the Rehabilitation Institute of Chicago took several months to help Patrick get on his feet. “He went from not even being able to lift his head off the bed to walking around with a four-point cane,” Patty says. At both institutes, doctors took advantage of the brain’s ability to heal itself. But progress was interrupted often. Patrick had seizures sometimes and developed epilepsy, Patty says. Patrick remembers the frustration of formulating what he wanted to say but hearing his mouth produce gibberish. A dramatic improvement was achieved when doctors at Bethesda rebuilt Patrick’s skull with a prosthetic implant, something Giffords eventually will have done. Somehow that physical re-aligning of his brain — putting it in balance, as Patty says — improved his functioning. His right side — which had been weakened by the damage to the left side of his brain — and particularly his right arm, which had hung useless by his side, began to respond. Today, Patrick can raise his arm over his head and give a firm handshake even though his right index finger can’t join the others in a hand-clasp, he says. “I guess my brain takes time to start doing the right thing again,” he says. In researching treatment facilities, Patty has flown across the country to investigate clinics. She found an intensive speech therapy program at the University of Michigan in Ann Arbor, where her husband’s verbal skills improved significantly over a three-month stay in 2009. 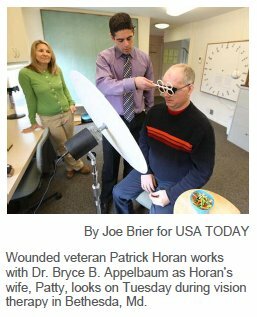 Since then, Patrick has continued with physical and speech therapy at Walter Reed Army Medical Center in Washington, D.C., and is preparing for a job there in medical contracting. Patty urges the Giffords family not to be deterred by anticipated deadlines in improvement that are not met on time. Pat did not always progress within the days, weeks or months that doctor predicted he might. But that doesn’t mean that his chances for improvement went away. But she found that these deadlines did not always matter. Patrick made it on his own timeline, albeit a bit later than expected sometimes. Patty also said she did not shy away from pushing her husband into doing better. For example, she very early on provided him a cellphone, even when he was still struggling to speak. Patrick began using it in spite of his struggle to formulate words properly. Patty says she is convinced that helped him improve more quickly. “He was never embarrassed. He tried to communicate how he could communicate early on,” she says. The Horans also say that one certainty for Giffords will be changes in her personality and temperament. But there is also a sweetness to Patrick that wasn’t there before, his wife says. Patrick himself concedes that he does not take routine setbacks so seriously. Share the post "Coping With Head Wound: ‘Happy That I’m Still Alive’"